Young Satwiksairaj Rankireddy doesn’t shy away from admitting his weaknesses. At 17, he is one of the brightest prospects in Indian doubles circuit but the promising teenager tends to lose matches from winning positions. Satwik admits that his “overconfidence” and “relaxed approach” during matches is what he needs to improve on as he looks ahead to a new season. “I think I was overconfident and too much relaxed on the court, which took away the game from us,” said Satwik who alongwith Pia Zebediah Bernadeth lost Hyderabad Hunters’ opening mixed doubles game against Kamilla Rytter Juhl/Lee Chun Hei of Ahmedabad Smash Masters, despite convincingly winning the first game. The pair eventually lost the tie 15-4, 12-15, 8-15. Satwik had a terrific season where he and his partner Chirag Shetty finished as the India No. 1 pair in men’s doubles. 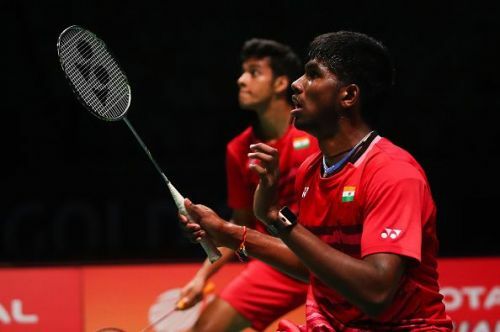 For a pair ranked outside 200 in 2016, making it to major events like the World Championship and Sudirman Cup justifies India’s growing prominence in world badminton not only in singles but doubles too. The duo, who won the Vietnam International Challenge in March 2017, even overtook the regular pair of B. Sumith Reddy and Manu Atri in the rankings, attaining the 31st position in the BWF rankings. In fact, national chief coach Pullela Gopichand had described the pair as "world-class" which has potential to win big events. “2017 was the best year for me. I played the World Championships, three Superseries quarter-finals, Sudirman Cup and finishing the year as India no. 1, for me it was kind of dream season. Next year, we have the Commonweath Games, Worlds, Asian Games. I am looking to make it to the CWG team and win a medal,” Satwik told this correspondent. The powerful stroke-maker credited Tan Kim Her for his meteoric rise, saying that the Malaysian's arrival helped him learn new technique and match strategies. Slow drops and half smashes are a few new things he is learning to add onto his armoury. “Playing in the PBL has also helped me as I am able to learn new strokes/techniques from players Yoo Yeon-Seong and Markis Kido, whom I have known for the last three years,” said Satwik, who has four International Challenge/Series titles each in men’s doubles and mixed doubles in 2016 when he also captured the attention of many buys with a splendid performance in PBL-2. Following the footsteps of his brother Ram Charan (state-level shuttler) and father Vishwanathan (a coach), Satwik had a sporting environment at home in Amalapuram, east Godavari district, right from the start and thus his inclination towards badminton wasn’t surprising. And it was only matter of time when he started winning tournaments, first district-level, then state and playing the quarter-finals of the Nationals. “I knew then that this is what I wanted to do. And I went to Gopi Sir academy in 2012 but I didn’t get the admission. It was the time just just before the London Olympics so I was asked to come later,” Satwik recollected, adding that he trained for a couple of month with coach Bhaskar Babu before joining the famed academy. Satwik also mentioned despite starting his career as singles player, it was in doubles where he earned good results since a junior (U-13, U-15). With a hectic calendar next season, Satwik is now focusing on improving his concentration during matches and for that he is planning to do meditation. “My mother has always told me to start meditating, yoga alongwith my training. I wasn’t paying too much attention to that. But now I planning to do it. My focus now would be on a full match not just one game, as after winning one game I tend to lose focus soon. “In India, doubles players don’t have a consistent result. So consistency is another thing I am looking to improve on and stay in top-10 of world rankings,” added the teenager.